Quorn is a township and railhead in the Flinders Ranges in the north of South Australia, 39 km northeast of Port Augusta. Start off your visit on the 22nd (Mon): take in nature's colorful creations at Powell Gardens and then stroll through Dutchman's Stern Conservation Park. To find maps, ratings, more things to do, and more tourist information, read Quorn visit planner . Sydney to Quorn is an approximately 10.5-hour flight. You can also drive. In April in Quorn, expect temperatures between 27°C during the day and 15°C at night. Finish up your sightseeing early on the 22nd (Mon) so you can travel to Hawker. Hawker is a town in the Flinders Ranges area of South Australia, 365km north of Adelaide. Kick off your visit on the 23rd (Tue): explore the striking landscape of Flinders Ranges National Park. On the 24th (Wed), you'll have a packed day of sightseeing: Head underground at Yourambulla Caves, then view the masterpieces at Jeff Morgan Gallery, and then explore the world behind art at Wilpena Panorama. To see where to stay, ratings, reviews, and other tourist information, refer to the Hawker trip planner . Traveling by car from Quorn to Hawker takes an hour. 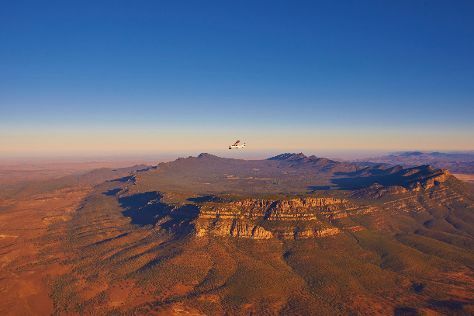 Wrap up your sightseeing on the 24th (Wed) early enough to travel to Flinders Ranges National Park. Escape the urban bustle at Wilpena Pound and Brachina Gorge Geological Trail. To find ratings, other places to visit, where to stay, and tourist information, you can read our Flinders Ranges National Park online trip planner . Drive from Hawker to Flinders Ranges National Park in 1.5 hours. In April, plan for daily highs up to 29°C, and evening lows to 15°C. On the 28th (Sun), you're off tohome.